Turning 100 is a big deal — especially when you’ve only become more successful and refined as time has gone on. And since most of us will never live to see an entire century (#morbid), it’s safe to say a centenarian deserves to be celebrated. So who better to celebrate than the leading business media giant that is Forbes? 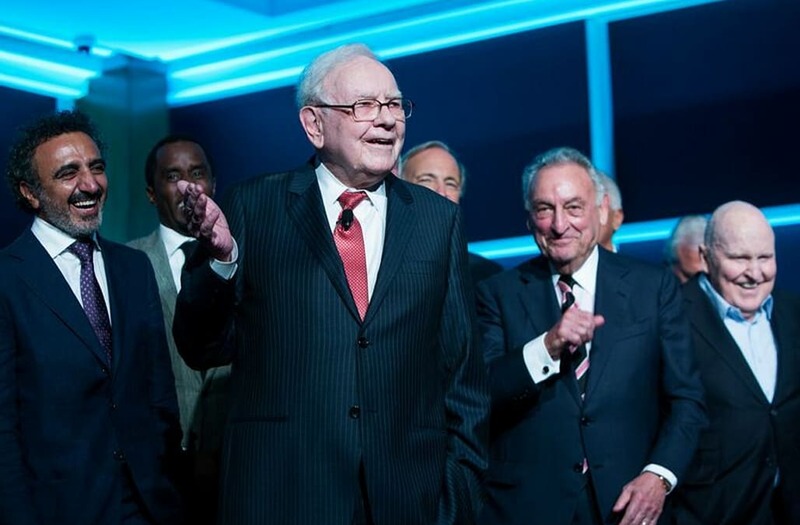 Distinguished guests included the world’s “greatest living business minds” and featured key remarks from Mike Perlis, Forbes Media CEO and Executive Chairman, Steve Forbes, Forbes Media Chairman and Editor-in-Chief and Warren Buffett, Chief Executive Officer, Berkshire Hathaway. Guests were also priveleged enough to enjoy a private, surprise performance by Stevie Wonder, who even brought Buffett himself up on stage for a truly one-of-a-kind duet! Honorees of Forbes’ Greatest Living Business Minds List gather on stage at Forbes’ Centennial Celebration. From left to right: Jeff Koons, Artist; Henry Kravis, Co-Founder of Kohlberg Kravis Roberts & Co.; Philip Anschutz (behind Kravis), Head of AEG and Owner of the Los Angeles Galaxy; Yuri Miller, Founder of DST Global; Arthur Blank, Co-Founder, Home Depot, and Owner, Atlanta Falcons; Patrice Motsepe, Africa’s First Black Billionaire; Jack Bogle, Founder and Retired Chairman of Vanguard; Jacqueline Novogratz, Founder, Acumen Fund; Eli Broad, Founder, SunAmerica Inc. and KB Home; James Patterson, Author;Steve Case, Co-Founder of AOL, Co-Founder, Revolution; Martine Rothblatt, Founder, Sirius, United Therapeutics; Morris Chang, Chairman and CEO of Taiwan Semiconductor Manufacturing Company; Jim Collins, Consultant and Author; Hamdi Ulukaya, Founder of Chobani Yogurt; Sean “Diddy” Combs, Hip Hop Mogul, Fashion Mogul, Liquor Mogul; Warren Buffett, CEO, Berkshire Hathaway; Craig Venter, Founder, Celera Genomics, Human Genome Sequencer; Ray Dalio, Founder of Bridgewater Associates; Sandy Weill, Banker and Financier, Former CEO of Citigroup; Larry Gagosian, Owner of Gagosian Art Galleries; Jack Welch, Former CEO of GE, Executive Chairman, Jack Welch Management Institute; Louis Gerstner, Former CEO of IBM; Muhammed Yunus, Founder, Grameen Bank, Nobel Peace Prize Winner; Dan Gilbert, Chairman and Founder of Rock Ventures and Quicken Loans Inc.; Steve Wynn, Founder of Mirage Resorts and Wynn Resorts; Steve Forbes, Editor in Chief of Forbes; T. Boone Pickens, Hedge Fund Manager; Jerry Jones, Owner, Dallas Cowboys. Sean “Diddy” Combs greets Steve Forbes with a kiss as he takes the stage to join other members of Forbes’ Greatest Business Minds List. The event came alongside the release of Forbes magazine special edition cenetennial issue, which features personal essays and lessons learned on everything from ‘Empathy’ by Sheryl Sandberg to ‘Revolution’ by Bill Gates. “Shepherding a brand like Forbes that’s iconic for entrepreneurial capitalism, we thought it important to both salute the last century and look towards the next one. In assembling what we believe to be the greatest-ever collection of business essayists and portraits, featuring the 100 greatest living business minds and their lessons for the next 100 years, we think this issue would make our founder B.C. Forbes proud." "We are better employees when we stop trying to be two people and bring our whole self to work. that doesn’t mean working around the clock. it means sharing what you are going through so that other people can empathize and help you." "We’re the first species capable of self-annihilation, and it’s extremely likely, given enough time. The question: Can we get ahead of it?" "I have always chosen to ignore the conventional wisdom in favor of the ideas that interested me. Inventing the future starts with intellectual curiosity — along with a healthy dose of skepticism." "Organizations resist innovation — and those that do inevitably fail — because people are more comfortable with what they know than with what they don’t." For the list of the 100 Greatest Business Minds, visit here.